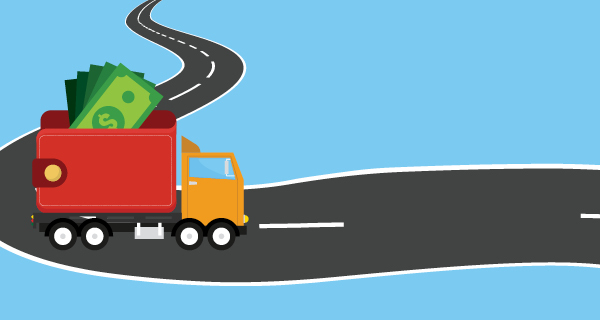 New supply chain finance strategies let shippers and carriers keep cash in their wallets. It's the classic win-win: Companies that buy a product or service get one month or more to pay, while sellers get their money in just a few days. Trading partners have used factoring, supply chain finance, and similar strategies for some time to maximize their cash flows. Today, though, advanced technologies are increasing the variety of available financing options. Probably the simplest strategy buyers and suppliers use to optimize cash flow is a discount for early payment. For example, a seller's invoice stipulates payment in 30 days but allows the buyer to take 2 percent off the price if payment arrives within 10 days. This strategy is also called dynamic discounting. Some companies choose this method to get a better return on their money than they could by hanging onto cash—say, leaving it in a low-interest bank account. "We've seen up to 20 percent annual return on some dynamic discount programs," says Michael Jud, director of product marketing at San Francisco-based Tradeshift, which operates a cloud-based network for supply chain payments, marketplaces, and applications. Because blockchain technology provides an unalterable public record of transactions, it can also increase the level of trust in finance arrangements. That's the theory behind a new product, Tradeshift Cash, that supply chain network Tradeshift has been piloting with a freight forwarder in Europe. Here's how it works: A vendor of products or services goes to the Tradeshift platform with a set of invoices, looking for financing. "Tradeshift Cash creates a market using the blockchain," explains Michael Jud, director of product marketing at Tradeshift in San Francisco. "The system won't necessarily identify the vendor, but it does confirm it's a trusted party." An investor—an institution or an individual—agrees to fund that collection of invoices, giving the vendor cash in exchange for a subsequent payment from the buyer. The blockchain records the trust factors for all parties involved in the transaction. It also organizes the transaction, stipulating where payments will go, from whom, and when. The blockchain provides information such as the buyer's credit worthiness. This allows the investor to evaluate the risk attached to each transaction when making an offer. "Or the investor could bundle several investments to create a balanced portfolio of some risk and some confident opportunities," Jud says. Truckers that can't wait even 24 hours to receive payment from a factor will be interested in a new mobile technology solution from FreightRover in Indianapolis. The program will allow independent truckers to receive payments not just during business hours, but at any time of day, any day of the year. "Transportation is a 24/7/365 thankless job," says Eric Meek, CEO of FreightRover. An owner/operator who accepts a load needs liquidity to pay the costs of hauling that load. "We want to instantly make the money available on the owner/operator's phone, or on a card, through a solution that will let them withdraw from an ATM without fees, and get that cash distributed as fast as we possibly can," Meek explains. Eventually, FreightRover might be able to use GPS data transmitted from a truck's electronic logging device (ELD) to signal when it's time to release a payment.